Once the target basket weight is chosen, the OASIS automated hanging basket system by Control Dekk automatically waters to that weight for every basket on the line. The risk of overwatering – and all its consequences – could be averted. 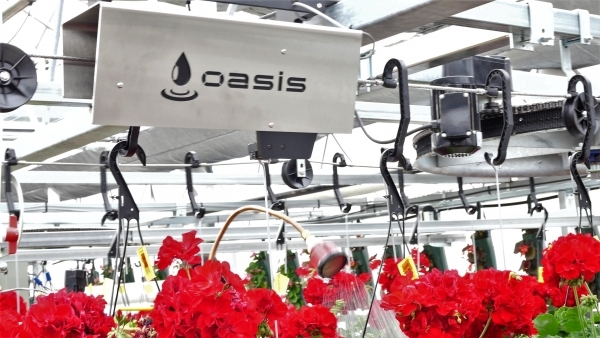 This could save on water, fertilizers and inputs used as well.“OASIS gives growers the confidence that the soil moisture is at the proper level, allowing them focus on other plant needs and gain efficiency with other horticultural practices,” says Jordan Dekker, managing partner. Control Dekk was formed by Dekker Brothers Greenhouse and long-time controls engineer, initially to improve their soil moisture management in their own operation. The programmable system also allows for dry down between watering, automated start times and mobile control via a smartphone or tablet. For greenhouse growers with existing cable conveyor systems or considering a new one, the Oasis hanging basket system can be added on. It comes in a standard and a custom series, and can be tailored to a specific greenhouse operation. Original article written by Greenhouse Canada, HERE.